Selecting a home care company is an important decision for you and your family. Now that you’ve learned about how home care works, it’s time to start the process of vetting your top choices. To get started, we strongly advise that you compare a few options — call and interview a minimum of three home care companies. This will help you better understand what is available and give you an idea of what each company has to offer, as well as how easy it is to communicate with them. To help you get started, we’ve put together a list of questions that will help you vet the home care companies you are looking into. 1. Are you licensed by the state of Florida? If so, how is your home care company registered (i.e. companion organization, registry or private duty, or home health agency)? 3. Are services available 24 hours a day, seven days a week? 4. What are the minimum hours of service a caregiver can provide? 5. What type of caregivers can you provide (i.e. registered nurses, CNAs, HHAs, companions)? 6. 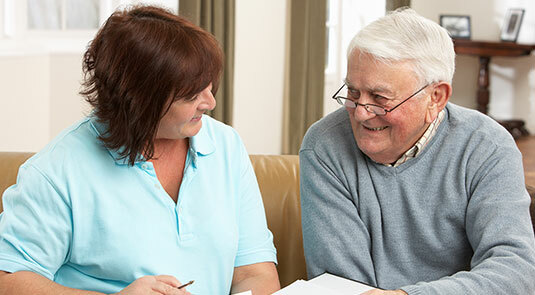 Do you perform initial care assessments to make sure I get the care I need? 7. How soon can services start? 8. What type of service agreement do you require? Can I see a copy? 9. Do you have a written care plan for each client/patient? Will I be involved in creating it? 1. What is your process for finding the best home care providers? 2. What type of background checks and screenings do you perform? 3. Are your caregivers CPR certified? 4. Do you vet all caregivers to ensure they can legally work in the United States? 5. Do you require caregivers to take a physical exam? How often is this required? 6. Will my caregiver have reliable transportation and insurance? How far do they drive? 7. What happens if my caregiver calls in sick or goes on vacation? 8. Will I see the same caregiver every day or do caregivers rotate among different clients? 9. Can I request a different caregiver if I’m unhappy with the original caregiver match? 10. What kind of supervision do your caregivers receive? Does anyone ever come and observe their work? 1. How long has the home care company been in business? 2. What is the communication process between the company, caregiver and me? 3. How often should I expect communication from you and in what form (written report, phone call, etc.)? 4. What is your process for matching me with the best caregiver for me? 5. What type of insurance do you or your caregivers hold to protect me and my family? 6. How do you monitor your caregivers to ensure they show up on time? 7. How often do you bill for services? Do you bill Medicaid or the insurance company directly? 8. Do you have references and satisfaction reports I can review? 9. Do you provide ongoing training for the caregivers you provide or refer? 10. Do you give advanced and written notice of all costs incurred for home care services? Ready to Start the Interview Process? You’ve heard it said that there’s “no such thing as a dumb question.” At Sonas, we agree. When it comes to you or your loved one’s health and well-being, the more questions you ask, the better your end results will be. Our team of home care experts would be honored to speak with you and answer any questions you may have. To get started, give us a call on our 24-Hour Home Care Hotline at (888) 592-5855 or follow the easy three-step-process shown below.